systems and leverage internal as well as external data to the max. The shift towards mobility services is hard, and even the biggest automotive companies face challenges that slow down the development of digital mobility services. Systems don’t speak the same language Modern cloud infrastructure, legacy systems, no common standards across industries—things don’t fit together. No secure scalability Little automation, bespoke partnerships, and data security challenges. Not a software company at the core Valuable software development resources go towards application level development or autonomous. Xapix is a backend to remove integration complexity. 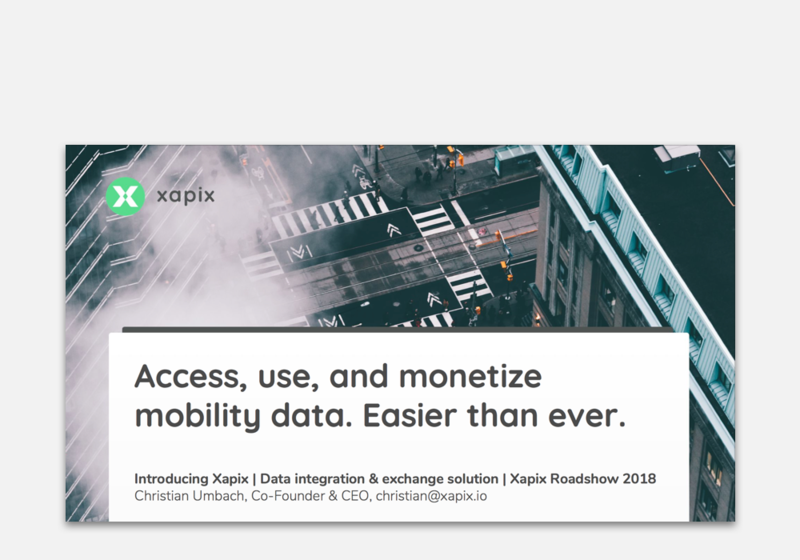 Our software lets our customers easily access, connect, and monetize mobility data. We integrate legacy and modern data Data transformation in the cloud, on premises, and on vehicle across modern & legacy formats. We’re partner-centric Visual editor with intuitive mapping ensuring low integration hurdles and data security. Shared data platform for engineers Shared API mediation layer with full data control on customer level. Xapix means enterprise data orchestration built for the specifics of the automotive industry: The product allows our customers to tackle interoperability challenges and quickly map to standards (where they exist). Our lightweight solution runs in the cloud and on the vehicle, which we have architected for extensibility towards a range of IoT protocols. Our customers love Xapix, because it has never been easier to create automotive APIs as a connector between different systems, be it legacy and new or internal and external. The possibilities are endless—we’re excited to hear what you’re planning to create with Xapix! Easily connect data from hundreds, thousands, or even tens of thousands of sources. Accomplish your projects in a matter of days instead of several weeks. Gain valuable insights in the usage of your data and APIs. Easily adjust your SOAP endpoints using Xapix. Connect to Kafka to process events as they occur. Xapix offers standout flexibility, customizability, and control. Our software can handle even the most custom use cases, which makes for more flexibility for your team and better end results. Speedy UI workflows let you complete your projects in just a few days. And anyone who can use Excel can also use Xapix. This way, you can keep your data integrations in the team—no need for contractors. Xapix as a multi service integration layer In order to make infotainment services available for customers across the globe, OEMs have to integrate an ever-increasing number of APIs. Xapix offers an orchestration layer to normalize, integrate, and transform data which is targeted at partnering. Middleware- and API management solutions fall short here, because they do not scale as easily; what’s more, they are also higher-maintenance than Xapix. Xapix as a flexible data transformation layer Setting up integrations, either internally or externally, leads to high complexity with regards to supporting different technologies, maintaining the data service, and feeding into a backend across different partners. Xapix offers a flexible API integration layer that can leverage integration adapters for certain services to ease that integration. Xapix as a flexible data sharing layer Using traditional means, offering custom data integrations (or data streams) for customers (across borders of SOAP/REST) is lengthy and expensive. Often, the customers’ requirements for integrations cannot be met, because other solutions often only provide a library of predefined adapters. Xapix offers flexible connectors that allow sharing the data in the envisioned format, which are also easy to create and maintain. If you want to learn more about how automotive companies leverage the powerful features of Xapix, feel free to check out the resources below. And if you have any questions, please reach out to us—we’re happy to help! A comprehensive summary of data orchestration with Xapix in the automotive sector. Everything Xapix in one document. Click on the button below to download the enterprise deck. Get the full technical briefing by downloading the technical reference for Xapix. build a smarter future, faster.